Consumers tell us they want a simple choice in an energy bar not complicated formulas or gimmicks. What we've done is taken a balanced approach to widely held principles of good nutrition, creating a blend of proteins and carbohydrates that the body can best absorb and use. At the same time, we continue to make taste a top priority. * More of the good stuff! Clif bars are packed with more juicy apricots, sweet chocolate chips, and larger chunks of almonds and peanuts. * More Nutrition! Each bar now has 23 vitamins and minerals for overall wellness, 5 grams of our proprietary fiber blend and 8-12 grams of soy protein for enhanced muscle recovery. * More Energy! According to a recent university study, the blend of carbohydrates, protein and fiber in Clif Bars causes a steady increase and then a gradual decline in blood sugar level to avoid the sugar high and crash often associated with refined ingredients and sweeteners, creating nutrition for sustained energy. * All-Natural Ingredients! 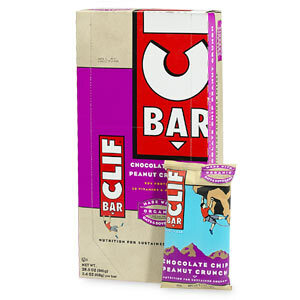 Clif Bar Inc. believes in using only the highest quality, all-natural ingredients. In keeping with this tradition, we use only non-GMO soy protein, meaning that none of the soy used in Clif Bar products has been genetically modified. Organic brown rice syrup, ClifProâ„¢ (soy rice crisps [soy protein isolate, rice flour, malt extract], organic roasted soybeans, organic soy flour), organic rolled oats, organic evaporated cane juice, organic peanut butter (organic peanuts, salt), peanut flour, ClifCrunchâ„¢ (apple fiber, oat fiber, organic milled flaxseed, chicory extract, psyllium), fig paste, peanuts, natural flavors, sea salt. Dicalcium phosphate, magnesium oxide, ascorbic acid (Vit. C), mixed tocopherols (Vit. E), ferric orthophosphate (iron), beta carotene (Vitamin A), zinc citrate, phytonadione (Vit. K1), biotin, niacinamide (Vit. B3), calcium pantothenate (Vit. B5), potassium iodide, manganese gluconate, copper gluconate, sodium selenite, thiamin (Vit. B1), chromium chloride, cyanocobalamin (Vit. B12), sodium molybdate, folic acid (Vit. B9), riboflavin (Vit. B2), pyridoxine hydrochloride (Vit. B6).